Pics and Kicks: Big Shots. Move over FoodLand. . . there's a new sheriff in town. Prints/Enlargements from film or digital. I'm personally loving that I can email them my images and they'll pump up the resolution for my large size files and print great quality prints. They also have a Kodak Kiosk. It has the capacity for basic edits, conversion to b&w and sepia etc. 1hour and next day processing. Printing at a resolution of 400dpi (there's only one other public machine on the island that has this capacity-Walmart and Costco is only 300dpi). Scanning of images, including negatives, for printing or burning to a disk. Portrait Studio: including passport photos, children, senior portraits etc. They print on high quality Kodak Royal paper- PROFESSIONAL PAPER AVAILABLE UPON REQUEST AND FOR AN ADDED FEE. For us pros: They will, as mentioned above, print on professional grade paper upon request as well as printing your copyright info etc on the back of the images. They can also add your logo to pro grade proof sheets. For pros who don't live on Oahu: You can send your images electronically and they'll print them and ship them off to you. They are very competitively priced. I'm so happy to do this little plug for Matt and Miha. I love their motto/mission statement: "We take our memories seriously, so let us help you preserve yours." They really do take their business seriously. I've been more than pleased by my experience in their store. They treat all their customers like old friends. It's a joy doing business with them. They're fast, cheerful, detail oriented and have customer service that would put anyone else to shame. Check them out in the Laie Shopping Center (they share a space with Ohana Video) or on the web here. Call them directly at 808 354 0321. 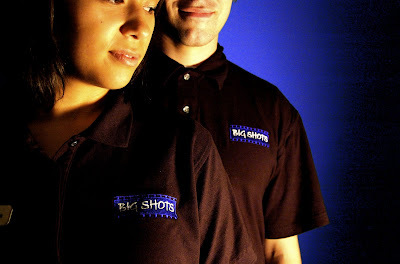 Best of luck Big Shots! I wish you a world of success! Very exciting that little Laie has such a neat place. Wow! Lucky North Shore photographers!